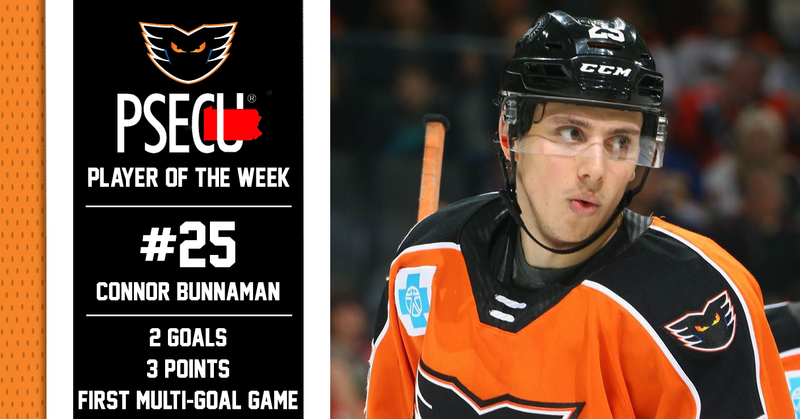 Lehigh Valley, Pa. — After recording the first multi-goal game of his career as well as finishing the weekend with three points (2G-1A) in three games, Lehigh Valley Phantoms forward Connor Bunnaman has been named the PSECU Player of the Week for the first time this season. The Phantoms began a three-in-three weekend on the road against the Utica Comets this past Friday. The game marked the first meeting of the season between the two squads and saw the return of Bunnaman who had been out of the lineup since January 23. After a scoreless first frame, the Phantoms wasted little time breaking the scoreless tie when Bunnaman picked up a loose puck in the Phantoms zone and dished a pass to Justin Bailey setting into motion a play that would culminate in Bailey’s 14th goal of the 2018-19 season. Despite scoring two goals just 45 seconds apart to begin the second period, the Phantoms would concede five unanswered goals and drop the Friday-night contest 5-2. After dropping the first half of a two-game set against the Hartford Wolf Pack inside of PPL Center on Saturday by a score of 2-1, Lehigh Valley looked to exact revenge against their Atlantic Division foes in a Sunday matinee game. While the Orange and Black jumped out to a 2-0 lead — thanks to goals from Reece Willcox (2) and Colin McDonald (5) — before the midway point of the first period, Hartford would battle back to tie the game at two apiece just 2:46 into the middle frame. Just 1:23 later, Bunnaman netted his first of two goals on the day when newly assigned forward Corban Knight fought through a check and centered a pass to the waiting stick of Bunnaman who banked it home for his 13th of the season. Later, at the 8:49 mark of the the second, Bunnaman was again be the benefactor of a Knight centering feed, this time on the power play, to put the Phantoms ahead 4-2 . Lehigh Valley went on to win the contest 5-2 and Bunnaman earned second-star honors on the night. Across 36 games with the Phantoms this season, the rookie Bunnaman now has 14 goals and 7 assists for 21 points. He also now ranks second on the Phantoms with six power-play markers this season.